Our babies aren't the only ones getting older and bigger... check out the latest mommies group meeting we had yesterday. 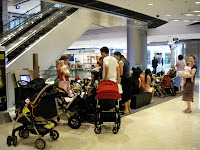 It was a real stroller convention! We had a lot of mommies and babies show up to chit chat and play together. Below are some photos. Most babies wore our mommies group "onesies". The onesies have our mommies group name, baby name, and birth order. Girls are in pink. Boys are in blue. See Natalie's #15 (the last number) onesie.